Above, the past - right, the same view now. The name 'Albion' is thought to be the ancient Greek name for the Island of Great Britain. The Romans preferred 'Britannia' and so it is easy to see how these once common pub names came into being. I believe the original pub sign from the fifties and sixties depicted a knight with the red cross of St. George on his shield. A clue perhaps is shown in the picture to the right. 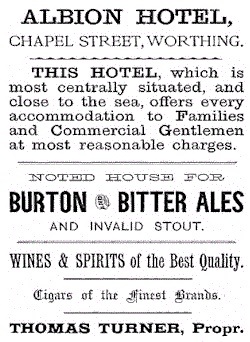 The Albion Commercial & Family Hotel was a Georgian period building dating from around 1800 and situated in what was then Chapel Street on the site of White & Browns livery stables which accounts for it occupying a large site. Thomas Russell, the Albion's first landlord was also the son of Worthing's first postman. 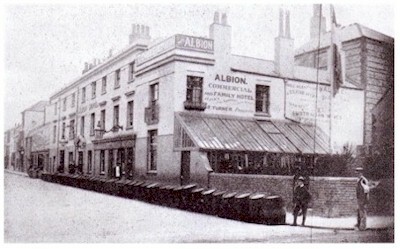 The Albion was rebuilt around 1935 and closed in 1961. The subsequent development contained Gamley's the toy store. 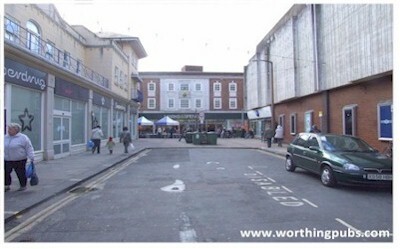 A later redevelopment replaced this with the Superdrug store that stands in its place today. 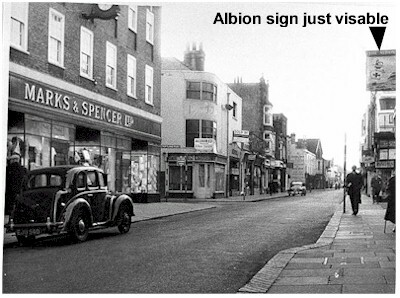 As you can see from the advert opposite, the Albion was in Chapel Street, what we now know as Portland Road. 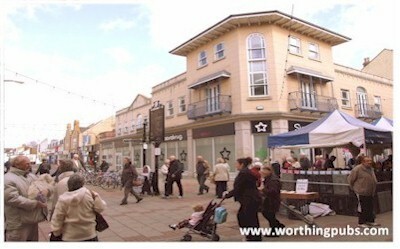 It was named Chapel Street after the chapel that once stood on the corner now occupied by Boots the Chemist. 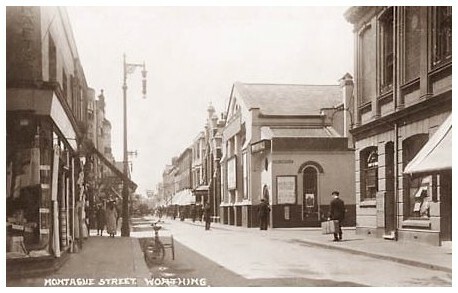 Chapel Street, which contained four pubs, originally ran from Richmond Road down to Montague Street from where it continued down to the seafront as Portland Road. Chapel Street was later renamed Portland Road to avoid confusion with Chapel Road. On the left is Montague Street looking west. 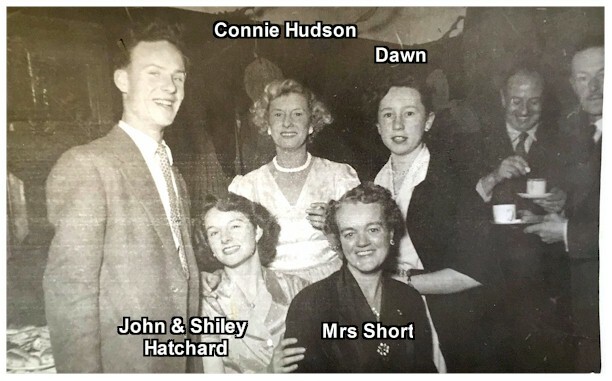 The picture is undated. 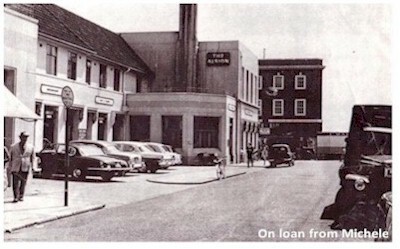 The right-hand side clearly shows the front of the Albion (Man with suitcase) and the Chapel across the road from it where Boots the Chemist stands today. Sadly there are no remnants of the original building left. Field Row, a wide alleyway (or Twitten) still runs behind where The Albion once stood. A map of 1875 shows a covered entrance to the back of the Hotel which lead to what was possibly a stabling area. I am inclined to think the Albion was rebuilt or modified at least three times in its life. Our grateful thanks to Steve Bray for permission to use this picture. 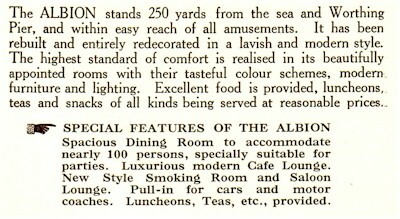 Labelled as 'Smoke room of the Albion Jan 1951 with Ken'. 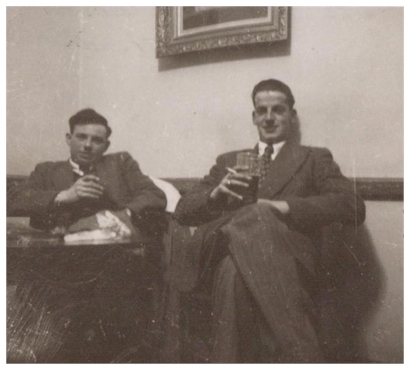 On the right is Les Bray - father of Steve. Ken remains unknown.